Only 11 Shopping Days Left! 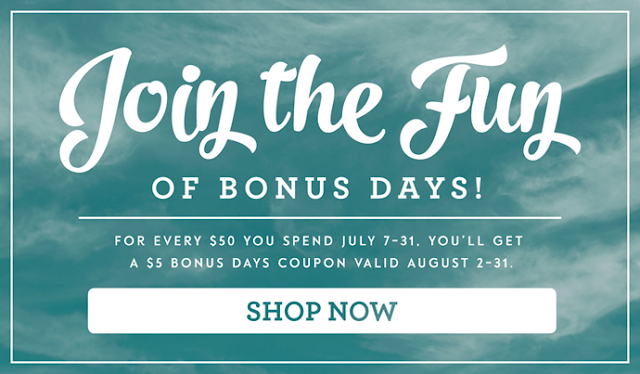 Participants will receive a $5 USD Bonus Days coupon code via email for every $50 USD they spend in a single order (catalog price before shipping and tax). There is no limit to the number of coupons participants can receive per order or throughout the duration of the promotion. There is no limit on the number of coupons participants can use on an order during redemption. Use must use an email address to received the coupon code from Stampin' Up! The coupon code will be emailed to you. If you lose the coupon code, Stampin' Up! WILL NOT REISSUE! I will not have access to your coupon code. I am personally offering an additional $5 discount* for every $50 order in July. My $5 discount will redeemable with your August 2 - 31, 2016 Stampin' Up! order from me. You MUST use Hostess Code BJJVWAR and SELECT ME as your Demonstrator in July and August. Go shopping online between now and Sunday, July 31, 2016 at Stampinup.com.